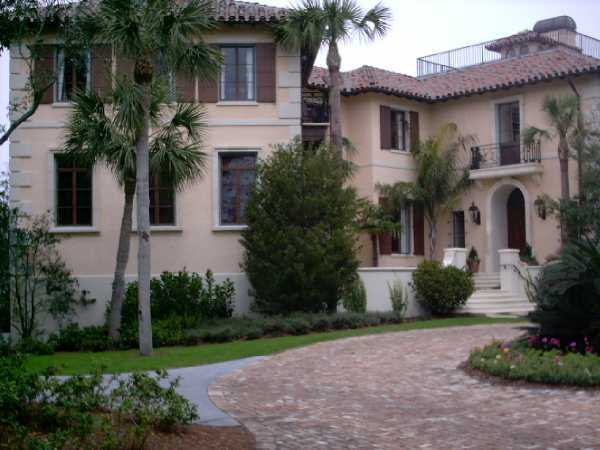 On the most northern point of beautiful Sea Island is the classic Mediterranean style residence of renowned architect/owner John Shackelford. The entry into the home features beautiful Peruvian brick flooring with limestone accents and a delicate wrought iron custom designed balustrade. Perched on the edge of the Hampton River, the visitor will be delighted by the panoramic view of river, marsh, and nature with Little St. Simons in the center of it all! As you explore this 8,600 square foot home, you will be delighted by the six beautifully appointed bedrooms. The master suite features a bar, a sitting room with custom mantel, a spacious bedroom, his and her closets and luxurious baths. This home was completed in early June of last year, just in time for the G-8 Summit. It was with great delight that Mr. Shackelford opened his home to First Lady Laura Bush as she entertained all of the First Ladies at an elegant dinner party. We learned that Mrs. Putin was especially intrigues by the magnificent home and you will be too! 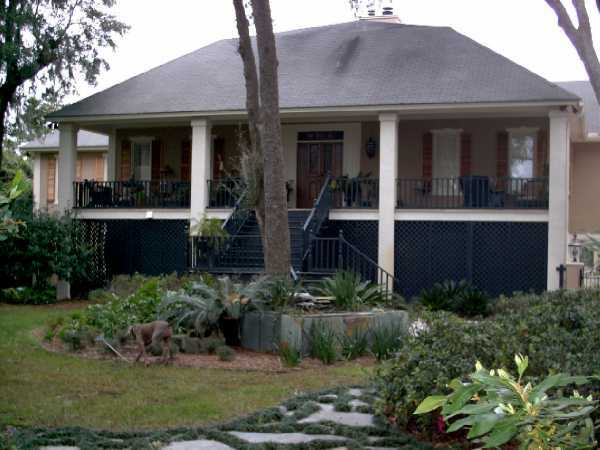 A formal portico and custom ironwork set the tone of this Mississippi bayou interpretation of Greek Revival Style. Upon entering the three story foyer your eye will be drawn to the marble floor. A music room and dining room on either side of the foyer are the perfect setting for entertaining. Understated elegance describes the top two floors of this home. The master suite includes a bedroom with marble fireplace, study and luxurious bath, a Jacuzzi tub, marble flooring and shower. 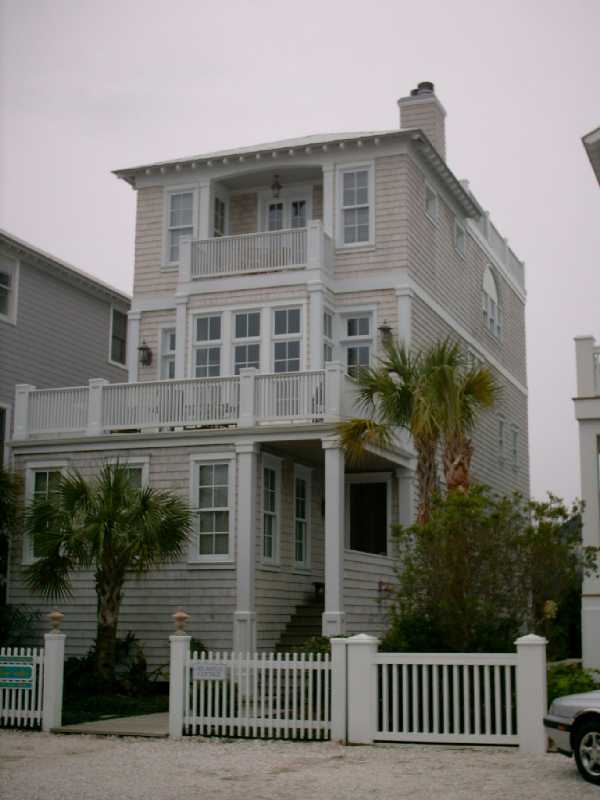 The third floor includes a den/media room and a stairway to the widows walk atop the home. 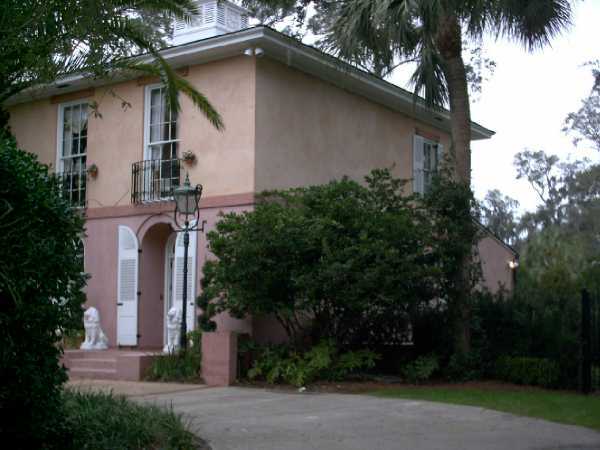 Certainly Scarlet O’Hara could have found happiness in this beautiful southern home. Built in the English Regency style by noted architect W. Frank McCall, this Sea Island home known as “The Hedges” is simply a classic. Built in 1976 as McCall’s personal island retreat, it has recently been renovated to meet the needs and tastes of a new family. The main floor features a formal dining room, kitchen area with bar, a charming garden room, master suite and separate guest wing. The garden room, with expanses of window and glass, looks out onto the newly designed landscape. Sunny shades of yellow, fresh greens and rick reds, mixed with floral printed fabrics set the tone for this happy home. You will love viewing the children’s artwork which has been cleverly framed and proudly displayed. The combination of architectural genius and beautiful interior design make this lovely home a must see! This luxury beach cottage near the sea was named Atlantus in honor of a United State Navy transport ship that brought soldiers home from Europe after World War 1. And, like its namesake, this cottage was designed to provide its occupants with a place to get away from the worries of the world in safety, comfort, relaxation and celebration. The past is always present here. The front door is French 18th Century oak. In the foyer, a 300 yr. old English stained glass church window greets you. It asks God to protect, fortify and defend the property. This theme is carried throughout with hand painted tile work in the bathrooms. Atlantus is well appointed with custom hand carved furniture, bronzes, oil rubbed hardware and antiques from coastal regions around the world! There is a significant African art collection and incredible shell work designed by Savannah artist Cathy Jarman. Touring the Atlantus Cottage you will find that the past meets the present and time stands still. Enjoy! 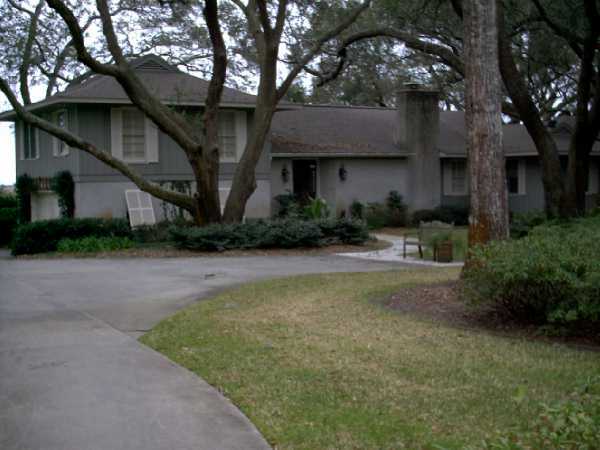 Nestled under a canopy of majestic live oaks is a family home called Marshside. Originally built in 1976, this home was renovated in 1997 under the direction of architect John Rentz. As you pass through the front doors, which interestingly enough once graced a New York City brownstone, you feel as if you have entered a very special place. The floor plan is open and informal creating the perfect setting for casual entertaining or large family gatherings. The home seems to become one with nature as views are afforded to every room. The deck that wraps around the entire east side of the home is the favorite spot for family members. There are interesting features throughout the home. Notice the mantle in the family room that came from an old railroad round house in Tennessee which was active in the 1860’s. Heart pine floors that were salvaged from an old church outside of Macon, Georgia, lead you down a hall and into the handsome library. The master suite is situated on the opposite side of the home. This room was actually the original living room. It is here that you have the best view in the entire house. Relax and enjoy this stop. Upon crossing the threshold, one instantly feels at home. Designed and built by Nancy and Bill Phelan, this river cottage with its raised porches and exterior stairs suggests an Acadian influence. 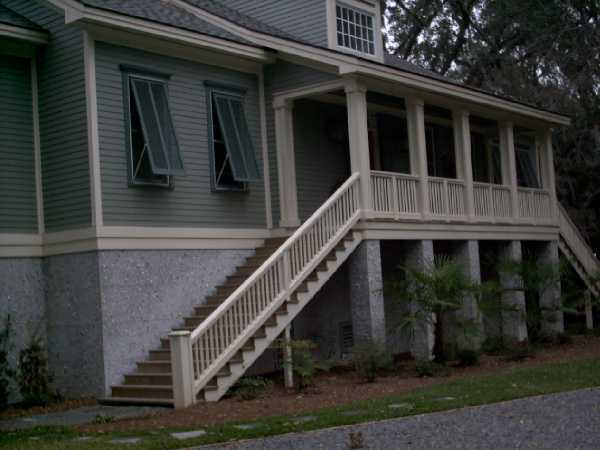 The home was positioned to take full advantage of the broad marsh views and the Frederica River. The open floor plan suggests a conventional Southern grace that extends an informal welcome to family and friends. You will notice immediately the homeowner’s attention to detail. The home features coffered ceilings, antique heart pine floors, wainscoting, graceful arches and the use of slate and tumbled marble. You will enjoy the homeowners collections of primitive antiques, the creative use of accessories and the delightful mix of the unexpected. The current owners purchased this house in 2003 and completely redecorated it with the help of Beverly Olliff of Southern Interiors and Island Remodeling, to reflect an old world flavor. 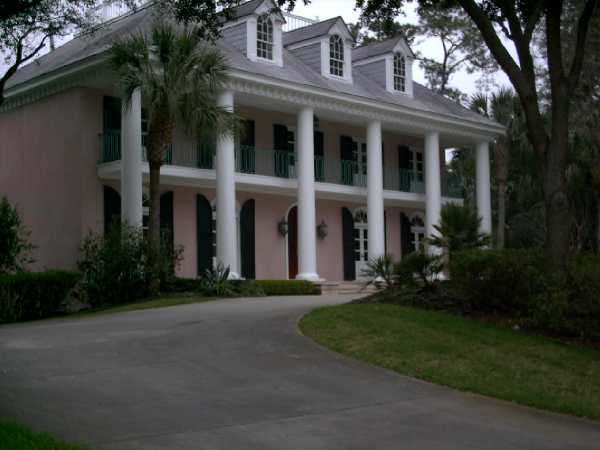 This home is three floors each offering individual living and taking full advantage of th marsh views and Frederica River. There is a wonderful art collection by such artists as Yasharel, Sabre, Catoy, Laura Maguiere, Janet Powers, Chuch Parsons and our own Peggy Everett. The painting doesn’t stop there! The murals in this home are incredible and all created by Doralynn Lowe over the course of eight months. The dining room furniture has been in the family for 150 years. Gorgeous antique rugs cover the floors. Outside, don’t miss the incredible two story, enclosed outdoor pool area. The lagoon pool and waterfalls were designed by Henry Worthy of Worthy Pools and provide more area in which to entertain and still enjoy the views of the marsh and river.